Indian Tool Manufacturers “ITM” – (A division of Birla Precision Technologies Ltd.) has newly launched Torpedo Taps and Drills & End Mills. ITM focuses on its R&D department to continuously develop exceptional quality products for its customers. As a result of this extensive study and continuous efforts, we proudly introduce ITM “TORPEDO” advanced new range of products to compete with international standards to ensure Superior Performance, Extra Tool Life and Guaranteed Results. I) Torpedo Series Taps are made out of the highest quality of Powder Metallurgy HSS materials. These High Performance Taps are manufactured on our latest CNC Machines, with specific geometries to suit different machining applications, based on work materials. ITM Torpedo series Taps consists of Spiral Flute, Spiral Point, Roll Form, and Straight Flute-Cast Iron. To enhance the performance of taps, we can supply these taps with surface treatment like TiN, TiAlN, TiCN etc. Spiral Flute Taps are best Suited for Blind Hole applications and are specially designed to eliminate chip clogging, they are available in size range of (Size Range: M3 to M16). 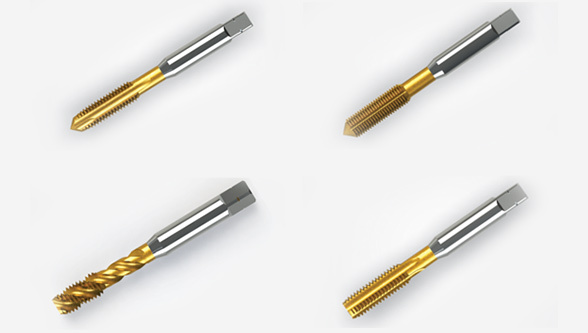 Spiral Point Taps are specially designed for Through-Hole application and are suitable for higher cutting speed for higher productivity. (Size range is from M3 to M16). Straight Flute – Cast Iron Taps are best suitable for Cast Iron material and size range is from M3 to M16. II) Torpedo Series of Drills are also made out of the advanced grades of HSS PM materials. These Drills are produced on our latest CNC Machines, with unique geometries to give better accuracy holes and excellent performance. These drills are developed to machine hardened steel materials like Stainless Steel, Nickel Chromium Steel and Forged Steel etc. These Torpedo High Performance Drills are designed having Special point geometry to reduce thrust forces while drilling. III) Torpedo Series of End Mills are made out of best quality of HSS grade of Materials. These High Performance End Mills are manufactured from our latest CNC Machines, with specia geometry to give better performance with higher productivity. These End Mills best suitable for materials like Stainless Steels, Nickel Chromium steels and tougher machining applications. These new series of our “Torpedo” range of Products are new generation tools which will work at higher cutting parameters on latest CNC Machines and we are very confident that these products are best solutions for your higher productivity.